This work was created during the WoW/UNY Governors Island Residency. Carolyn Hall and Clarinda Mac Low were in residence on Governors Island in 2018. Clarinda Mac Low and Carolyn Hall in conversation about Sunk Shore, speculative futures, contextual events and politics, and climate change education using a localized sense-based approach. Conversation has been edited for clarity. How does the future get shaped and by whom? Carolyn Hall: In “Sunk Shore” we were investigating practical versions of realistic, utopian, and dystopian futures. We included a lot of data around the physical aspects of climate change, and only touched briefly on the social and political worlds that affect how we manage those changes. CML: What’s the most effective, or fair, or kind way of organizing society? Does it work better to have many different localities responsible for their own place, and then form a network? Or is centralized government more efficient? A question I have is, if there is more collective decision, will it lead to better decisions? CH: If the people in power, or the people making those decisions, are those who care less about or are less influenced by the fact of climate change—this will create our hypothetical dystopian future. These are the people with resources, who don’t feel that they are affected by climate change--they can buy themselves out of the problems. CH: It probably is related somewhat to what people know, and what kids are being taught. Education systems are localized, and states or counties can decide what they teach in the public schools, so information is different from region to region. We are not, as a country, getting the same education. And as news-hungry people, we can choose our news and so we’re not getting the same news either. So there’s no neutral service of education or information. I mean, I don’t know what neutral is and I think we would have a very interesting time trying to define neutral. CML: ...locally, anyway. Globally, it’s complicated, of course, and that affects us. But because we’re the largest consumers on the planet, what we do as a country, as a nation state, affects everybody else. CH: I think it’s us and China. CML: How does this work socio-politically? Because if you have a benevolent dictator, or even a non-benevolent dictator, that decides, “I’m going to address climate change,” it could be quite effective. It’s fucked up! But it could be quite effective. How does climate change work, and how can we best explain it to a broad audience? CH: We accept data as fact. I think the issue is that even straightforward factual data can be willfully misinterpreted. CML: Who are the people interpreting it? That’s always going to be the question. CH: And what are they looking for? CH: One of the magazines that I brought into the house [5B on Governors Island, WoW/UNY residency house] was all about the history of talking about climate change. And from the late 1970s to the mid-1980s, the politicians were mostly on board, they knew we needed to talk about this. It changed during the Reagan years. In 1987, James Hansen, a scientist with NASA was invited to testify at a Senate hearing about climate change, but someone in the administration didn’t like his scientific predictions and demanded he change his testimony. He refused to change and since he was a government employee, they could refuse to let him speak. The way around this was for him to present as a private citizen because they couldn’t censor him that way. So he had to come as a private citizen “Atmospheric Scientist.” And he presented, introducing himself with his NASA credentials, but because he was supposed to be there as a private citizen, he couldn’t be listed as a NASA government scientist...they were trying to silence and discredit him. CH: Right! Like in the ‘70s, the Clean Water Act and the Environmental Protection Agency and Endangered Species. But now it’s so difficult to get the government to take action - that’s the urgency now. And it’s difficult because the effects of climate change aren’t as immediate. It’s not affecting people in their homes unless there’s a natural disaster. But it isn’t affecting them on a daily basis, like acid rain or polluted fish or a “hole” in the ozone layer...it’s easier to ignore. CML: Yeah, but now rivers are flooding! CH: Right, but that’s natural. Because it rained. Or there was a storm. CML: Right, it’s hard to prove a storm is unnatural. So what I’m saying is that when the crisis hit in the ‘70s and ‘80s, it was affecting even the people who had money. Coastal properties stank. And they stank for the rich and they stank for the poor. CH: But today - we’re getting more storms. Well, I guess we’ll build a storm wall or we’ll put embankments around our house, or we’ll raise our foundation a few feet. That’s short term, not long term. CML: Yes. Everywhere there is a waterway, any kind of water as a body will be affected by climate change and that affects you. This happened with [Hurricanes] Florence and Michael where they were felt much farther inland with terrible consequences than anyone expected - and it had happened before. CML: They’re still recovering from it. CH: They’ve had to rebuild. 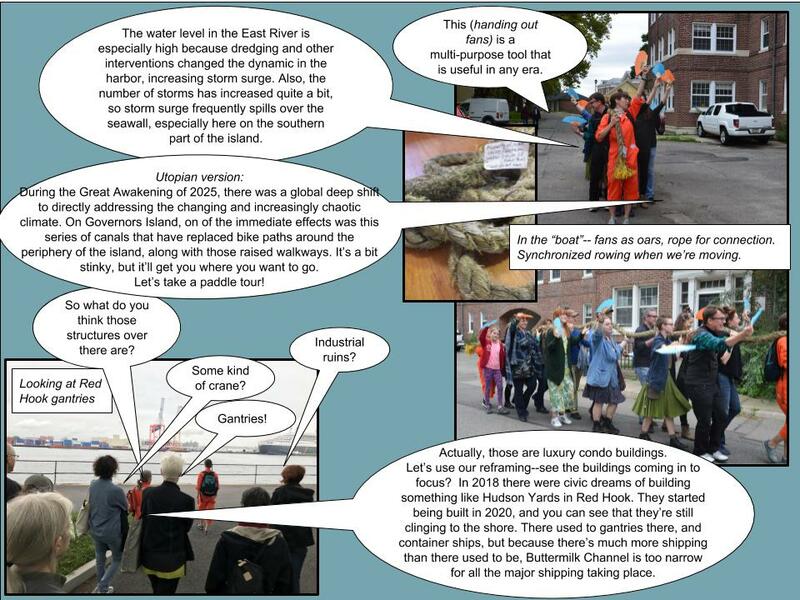 CML: ...if educators went around and said “So how’s your waterway been lately? Well this is what’s happened and this is what’s happened. Oh that’s because...that would be climate change.” I don’t know if it would work but if we are discussing how to reach more positive futures when climate change is so intractable or impossible to sense, the education campaign would have to be one where people could absorb without having to think politically in that way. Just, okay let’s observe what’s in our backyard. CH: Right. You have to talk about what people can hear, see, and feel. So that it’s tangible. CML: Yeah, that’s the plan. Carolyn Hall is a Brooklyn, NY based historical marine ecologist, Bessie award winning dancer/performer, and scientific communication instructor. She has worked with numerous choreographers and companies both nationally and internationally and is currently involved in projects with Carrie Ahern, Third Rail Projects, and Clarinda Mac Low/TRYST. As a freelance ecologist she has worked with the Wildlife Conservation Society, the Environmental Defense Fund, and is the research assistant and fact checker for the best selling author Paul Greenberg. She also teaches with the Alan Alda Center for Communicating Science. Interdisciplinary public engagement projects that combine her artist and scientist halves increasingly intrigue her, which has happily led to becoming a part of the Works on Water and Underwater New York communities. Clarinda Mac Low started out working in dance and molecular biology and now creates participatory installations and events that investigate social constructs and corporeal experience, with a recent concentration on climate change. She is also Executive Director of Culture Push, an experimental organization that links artistic practice, social justice, and civic engagement, a co-founder of Works on Water, an organization that supports artists working with water as site and material, and a medical journalist specializing in HIV/AIDS. Mac Low has recently “performed” dramaturgy for Katy Pyle’s Ballez, David Thomson’s he his own mythical beast, and Gender/Power (Maya Ciarrocchi and Kris Grey), among others. Grants and honors include a BAX Award in 2004, a Foundation for Contemporary Arts grant, and a 2007 and 2010 Franklin Furnace Fund for Performance Art grant. Mac Low holds a BA, double major in Dance and Molecular Biology, from Wesleyan University and an MFA in Digital and Interdisciplinary Arts Practice from CCNY-CUNY. She currently teaches at NYU (ITP).